Victory Motorcycles has revealed the second video featuring the Victory Motorcycles / Roland Sands Project 156 Pikes Peak Hill Climb prototype racer. Victory Motorcycles Racing programs including the NHRA team, and the recently announced Isle of Man TT racing effort all are indicative of a new energy and direction for the brand. 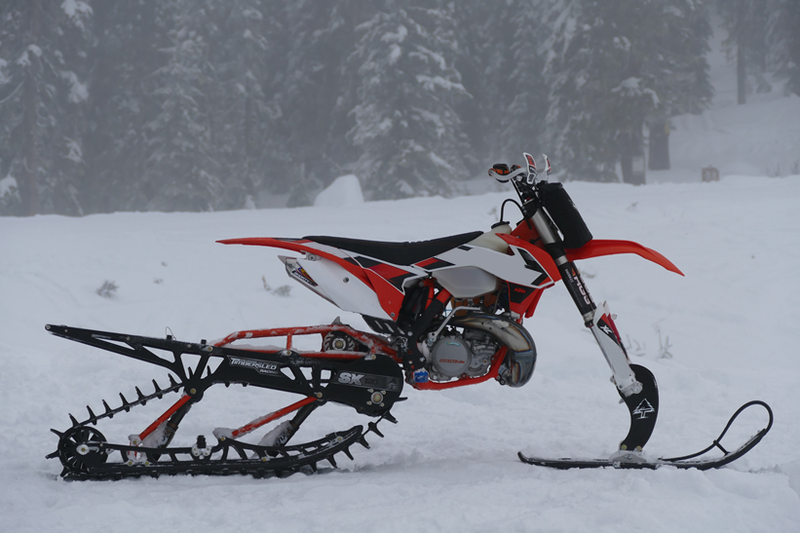 Polaris Industries Inc. (NYSE: PII) has acquired Timbersled Products, Inc. a privately held Sandpoint, Idaho-based company that is an innovator and market leader in the burgeoning snow bike industry. The terms of the transaction were not disclosed. Timbersled will continue to operate as a distinct brand and the operations will remain near Sandpoint, Idaho. Sales increased 16% to $1,033.3 million, setting a new record for the first quarter. North American retail sales increased 8% in the first quarter. MINNEAPOLIS (April 23, 2015) — Polaris Industries Inc. (NYSE: PII) today reported record first quarter net income of $88.6 million, or $1.30 per diluted share, for the quarter ended March 31, 2015, an increase of nine percent from the 2014 first quarter net income of $80.9 million, or $1.19 per diluted share. Sales for the first quarter 2015 totaled $1,033.3 million, which represents an increase of 16 percent from last year’s first quarter sales of $888.3 million. “I am pleased to report record sales and earnings for our 2015 first quarter, with sales up 16 percent, operating income up 19 percent and net income up nine percent, our 22nd consecutive quarter of record earnings performance,” commented Scott Wine, Polaris’ chairman and chief executive officer. “We outperformed the market again in most of our businesses in spite of increased competitive promotional pressures, weakening global markets and the corresponding negative effect from currencies. While we are justifiably proud of these accomplishments, we remain focused on seizing the numerous opportunities we missed to perform better. From factory inventory being too high to ongoing production inefficiencies, particularly in motorcycles, we did not perform to our capabilities or our expectations. Motorcycle sales increased 74 percent in the 2015 first quarter to $137.4 million. All three brands, Victory, Indian Motorcycle® and Slingshot, increased sales in the first quarter. Consumer retail demand for Victory and Indian Motorcycles during the 2015 first quarter, was up nearly 40 percent over last year’s first quarter, driven primarily by strong Indian Motorcycle retail sales, while first quarterNorth American industry heavyweight cruiser and touring motorcycle retail sales were up low-single digits percent from 2014. Slingshot retail sales were ahead of expectations. All three brands added to their product portfolios during the quarter with Indian Motorcycle introducing the Indian Chief Dark Horse, which is built upon the successful and award-winning Indian Chief® platform with only a flash of chrome and a heavy dose of matte black paint; Victory showcased the new Magnum X-1, a new bagger with a 200-watt, 10 speaker audio system and custom factory paint; and Slingshot adding a limited edition model packed with head-turning features, including striking Nuclear Sunset Orange coloring, dual windscreens and an interior LED lighting package. Sales of Polaris motorcycles outside of North America decreased 12 percent in the first quarter of 2015 as compared to a year ago due to the currency impact of a strengthening U.S. dollar. Polaris purchases Hammerhead who manufacure in Shanghai, China therby expanding their international manufacturing footprint and off-road products. Polaris Industries Inc. (NYSE: PII) today announced it has signed an agreement to acquire HH Investment Limited(”Hammerhead”). Hammerhead manufactures gasoline powered go-karts, light utility vehicles, and electric utility vehicles in Shanghai, China. The Company markets its products globally under the Hammerhead Offroad®brand, along with maintaining key private label relationships with other OEMs. The transaction is expected to close within the next 90 days. The terms of the pending transaction were not disclosed. Polaris Industries Inc. has announced the acquisition of Teton Outfitters, LLC, a privately owned, Rigby, Idaho-based company which designs, develops and distributes KLIM Technical Riding Gear. Calendar year 2012 sales for KLIM are anticipated to approach $30 million. KLIM is an industry leader in technical riding gear. This acquisition adds KLIM to Polaris’ growing parts, garments and accessories (PG&A) business. The terms of the transaction were not disclosed. KLIM is known not only for superior quality, innovation and performance, but also for its understanding of riders’ needs and devotion to addressing them in its products. This passion underscores KLIM’s culture and vision, which in many ways mirror Polaris’ own guiding principles. KLIM was advised by The Meriwether Group. The Atlantic Motorcycle and ATV show opens its doors this Friday (February 10th, 2012) and runs through to Sunday. The Atlantic Motorcycle and ATV Show will roar into Moncton, this Friday thru Sunday. This event will encompass the entire Moncton Coliseum complex and will showcase the latest products for motorcycle, ATV and off-road enthusiasts available on the market today. The nation’s leading manufacturers will be well represented and visitors will not be left disappointed. The Atlantic Motorcycle and ATV Show is one of 7 successful, national manufacturer supported motorcycle shows from coast to coast. Owned by the Motorcycle & Moped Industry Council (MMIC) this event is the only show of its kind and caliber in Atlantic Canada. Since 2008, the event has delivered over 50,000 qualified buyers who have enjoyed the biggest and best names in motosports. Show Manager Scott Sprague is revved up about the 2012 edition of this event. “Being a part of this huge chain of manufacturer supported shows is phenomenal. For a visitor to be able to see a booth that is the same display at the MMIC-COHV Shows in Toronto, Vancouver or elsewhere right in Moncton, the hub of the Maritimes, is fantastic and convenient for all of Atlantic Canada and beyond,” said Sprague. The Atlantic Motorcycle and ATV Show is where Atlantic Canada RIDES and BUYS! Visitors will be shopping the show and trying that new ATV or Motorcycle on for size and discussing the purchase with their local dealer plus getting all of those tough questions answered right from manufacturer representatives. Visitors can take home awesome deals on parts & accessories, clothing and apparel and so much more. The event is also the leading venue to meet the organizers of local rallies, motorcycle and ATV clubs, destinations, anything and everything to do with the lifestyle that comes with this pastime. Visitors can enter to win His and Hers Riding Gear compliments of Speed and Strength Gear and Toys for Big Boys. Simply fill out a ballot and it could be you! Triumph Motorcycles have come out in a big way this year with several custom show bikes including the Tom Cruise Mi3 Scrambler, the Orange County Choppers Triumph Retro Bonneville Custom and many more. Also Triumph, in partnership with Atlantic Motoplex will be presenting Juno Award Winner, Clayton Bellamy of the Road Hammers. Clayton will appear on stage performing during ladies night and in the Triumph booth alongside THE WILD ONE.’ Sucker Punch Sally builds us a modern day BRANDO WILD CHILD, this Bird will be ridden in the release video of Clayton’s new album. See them both at the show. This year’s highlights include the Yamaha Riding Academy for kids that will also feature ALL NEW ATV training for youth. ATV Training available upon request. In addition to that there will be Yamaha Scooter School training, especially appealing to the ladies; this will be held on Friday and Saturday evening. And speaking of the ladies, join us on Saturday night from 5 pm – 9 pm when it’s free admission for ladies night, when a regular admission is purchased. There will be special prizes and giveaways just for women, plus our fashion show at 7 and Ladies Scooter training at 8. The Women on Wheels Fashion Show will also be on each day so be sure to check out the terrific line up of manufacturers clothing modeled on stage from Yamaha, Honda, Harley Davidson, KTM, Victory, Ducati, Suzuki, Triumph and BMW. And join world rider, Rene Cormier, as he talks passionately about his moto-adventures through Africa and beyond. Meeting him is an adventure YOU won’t want to miss. Also, visitors can check out the all new show and shine featuring local motorcycles. Proceeds to benefit the Bernice McNaughton Bike Club. Join special guests from River Glade Speedway, as they celebrate 35 years and showcase some of the hottest bikes from the 70s right there on display including a slide show of racing at the track from past and present. The bikes that will have on display for comparison purposes are a 1977 Cr-125 Honda, a 1987 CR-125 Honda as well as a 1997 CR-125 Honda. There will also be a 1979 Can-Am MX-5 250. These Honda's will illustrate the many changes the bikes have undergone over the years. Although 125's are no longer made for the most part, as the 250 4-stroke took over that class of racing we will most likely have a four stoke on hand as well to show further enhancements. These bikes will show the progression from air cooled to liquid engines, from drum brakes to disc brakes, steel frames to aluminum frames and from four inches of suspension travel to twelve. Also, horse power more than doubled over the years!